Origin: Cambodia and Thailand, Asia. 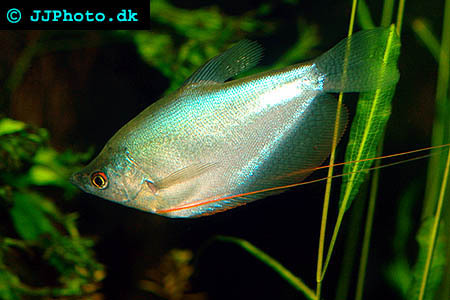 Company: Trichogaster microlepis (Moonlight Gourami) is suitable for community aquariums and can despite their size be kept with smaller fishes. Aquarium setup: They should be kept in an large heavily planted aquarium tank. The tank should contain floating plants which the fishes using during their spawning. The may damage fine leafed plants. Avoid heavy circulation. Feeding: This species accepts dry food. 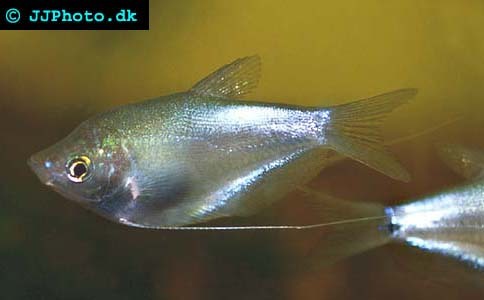 Breeding: Trichogaster microlepis (Moonlight Gourami) builds bubble nests. The spawning can be triggered by lowering the water temperature and raising the temperature. The male guards the nest he builds among the floating plants until the fry becomes free swimming. The fry is very small and requires small food.